The ELx50 Washer is now a truly flexible platform that provides washing capabilities unsurpassed in its class. Newly available models with biomagnetic separation and vacuum filtration capabilities make the ELx50 an excellent choice for automating the wash steps of 96-well magnetic or polystyrene bead assays, such as those developed on the Luminex xMAP® technology platform. Users not requiring an integrated stacker can expect the same great bead washing performance as BioTek’s industry leading full plate washers but here in a more compact footprint. Comprehensive onboard software makes programming quick and easy. Custom magnets, in either flat or ring designs, incorporate high-energy neodymium iron boron magnets for rapid separation of micrometer and nanometer magnetic beads with superior retention. A fast and efficient vacuum filtration module allows vacuum to be adjusted with a range of settings for flexibility with polystyrene beads when using various filter pore sizes and sample viscosities. The vacuum filtration module is also well suited for filtration-to-waste processes such as PCR cleanup after DNA amplification to remove unwanted residues or reaction by-products with filtrate. The washer’s modular platform allows for processing standard solid bottom plates used in a laboratory’s many traditional ELISAs and cell based assays. The ELx50 can also be equipped with our patented Dual-Action™ 16-channel manifold. This breakthrough design allows for independent control of the dispense and aspiration manifolds for overfill washing and overflow protection in both 96- and 384-well formats. The problem of fitting dispense and aspirate tubes into a much smaller 384-well is solved with the ELx50. Additionally, in a 96-well format, the Dual-Action manifold provides incomparable wash performance with two sets of dispense and aspiration tubes per well. This exclusive method of two-fold aspiration guarantees low residuals. As a welcome upgrade from manual processing, the new ELx50 Microplate Strip Washer will bring to your lab an all inclusive wash solution offering consistent performance and unattended operation. 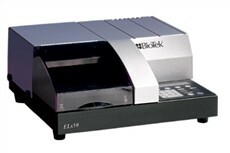 Regulatory: All BioTek microplate instrumentation is CE and ETL marked. There are no threads in BioTek ELx50 Reviews at this time.